Cost – Resources (money) spent by a firm in its regular operations. Includes fixed costs which remain the same regardless of volume, and variable costs which increase with increased volume. Costs are distinct from a capital investments which are really just a conversion from one kind of asset to another. Income from one-time windfalls (e.g. the sale of a piece of real estate) are not considered revenue (unless the firm is in the business of flipping real estate). Neither are cash investments by the firm’s owners. Profit – Total Revenue – Total Cost = Profit. Economists say that “profit is the return on the resource entrepreneurship”. Depreciation – The process of expensing an asset’s cost over its useful life. In keeping with the matching principle of accounting, the expense of an asset should be assigned to the periods in which that asset was used to make money. The simplest way to depreciate something is the straight line method, in which the difference between an asset’s purchase price and salvage value is divided by it’s useful life to get an equal amount of depreciation each period. Classroom examples (other than in accounting classes) tend to use straight-line depreciation because it is simple. In practice, most firms use some sort of accelerated depreciation in which a larger depreciation expense is taken in the earlier portion of an asset’s life–creating better tax advantages. Methods include the modified accelerated cost recovery system (MACRS), double declining balance (DDB), or sum of years digits (SYD). Some firms use a different depreciation procedure for their tax accounting than for their general accounting. The useful lives of some assets are more properly expressed in units of production instead of years. For instance, a fleet car might be expected to last 150,000 miles. In this case, units of production (UOP) depreciation might be used. The number of miles the car was driven would be divided by 150,000 each period to find the percentage of its value to be depreciated. Simple Interest – Interest taken as a simple percentage of the principle. Interest does not add to the principle. For example, if you borrowed $10,000 at 10% simple interest then your interest payment each period would be $1000. Compound Interest – Interest is added to the principle, so that the amount of the interest payment is different each month and a the ratio of interest/principle paid is higher earlier in the loan repayment. The amounts of interest and principle can be found by making an amortization table (probably with a spreadsheet) or by applying formulas. Example: Borrow $10,000 at 10% compound interest, compounded monthly, to be repaid in 24 monthly payments. Please note that this is just the formula for the present value of an annuity, solved for C. You really only need to memorize one, and you can derive the other when needed. 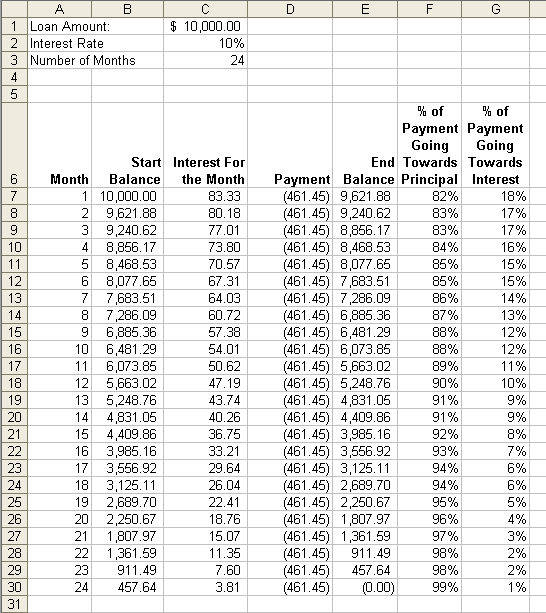 Once you know the payment amount, the rest of the amortization table is just arithmetic. Price Mark Ups and Mark Downs – Increasing or decreasing the base price by a given percentage. You multiply base price by 1 plus the percentage. If you thought that the final price in the third example should have been $50.00, look again. It is important to use the right base price. Horngren, C., Harrison, W., & Oliver, S.(2009) Accounting [8th Ed. International Ed.]. Upper Saddle River, NJ: Pearson. McConnell, C. & Brue, S. (2008). Economics: Principles, Problems, and Policies [17th Ed.]. Boston, MA: McGraw-Hill Irwin.